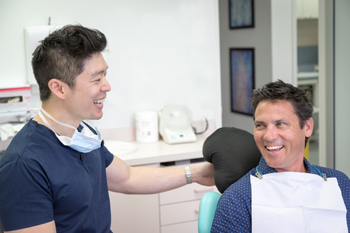 Dr Daniel Chan and our team are committed to making your visit at Southern Dental Care – Smile By Design one that puts your mind at ease. Please arrive 15 minutes before your scheduled visit to complete our new patient paperwork. These forms are also available online. We will thoroughly examine all of your teeth as well as record a series of diagnostic dental x-rays and photographs. These images allow us to pinpoint any underlying problems that may not be visible clinically. You should reserve approximately 45 to 60 minutes for your new patient appointment. Our team is committed to providing same-day services in the instances of urgent or emergency dental treatment at the time of your new patient appointment. Should any other services be needed, we will create a customised care plan and schedule you accordingly. You will be provided with a breakdown of all care options and costs to assist you in planning any necessary treatment. We accept all health fund providers as well as government dental programs for children and DVA patients. We have an on-site HICAPS machine so you can claim on the day. Please feel free to discuss any financing concerns with our front desk, as we can accommodate payment plans if necessary. The Child Dental Benefits Schedule (CDBS) provides basic dental services to children aged between 2 and 17 years. Over 2 consecutive years, the dental services are capped at $1,000.00. The 2-year cap period starts when one between 2-17 years, first gets an eligible dental service. Get the smile you have always wanted now with Interest Free Dental Plans! Find out more and contact us to book your appointment. We offer flexible payment options with zip money. Learn more and apply now to start your dental treatment without the financial stress. Daniel is able to accommodate all new patients for comprehensive exams as well as smile rejuvenation consultations. Please let us know which you prefer at the time of scheduling your appointment. Contact us today to enjoy a healthier, confident smile.